Our law office can help you get the compensation you deserve if you were injured at work. The insurance company has their workers’ compensation lawyers. You need one too. If you were hurt at work you may not know what you are supposed to do next. Having a Boston workers compensation lawyer on your side ensures the best possible outcome for your case. A work injury can cause many problems. You can’t work; you are injured; and you have medical bills. We can help you with all these issues, so you don’t have to worry about them. Instead, you can focus solely on your recovery. We guide you through the claims process. We obtain all your accident-related medical records, handle all communications with the insurance company, as well as go to court to protect your rights and entitlement to benefits. We only get paid if we win your workers comp claim. Getting hurt at work can be frustrating, painful, and stressful. The insurance company may be sending you paperwork. When you are hurt on-the-job and unable to work, making the right decisions is critical. Making sure you protect yourself, and your rights, is essential. Many people injured on the job also, depending on the seriousness of their injury, may pursue a claim for Social Security Disability Insurance (SSDI). We can help you if you have applied and were denied these benefits. Why Should I Hire A Lawyer For My Workers Comp Claim? The insurance company is going to fight to minimize their liability and the amount that they must pay. They will not tell you about your rights, or the full extent of the compensation that is owed to you. They will also try to underpay you the true amount that you are owed. Insurance companies will typically deny or minimize the medical treatments to which you are entitled. If you have been hurt at work, you deserve the full medical treatments that are provided under the law so that you can properly heal. The insurance company will have an incentive to avoid or discontinue medical treatments to save the money. Legal fees for workers compensation matters are much less than for personal injury matters, and are set according to law. Typical contingency fees for most personal injury cases are 33% or more (often depending upon whether a case goes to trial); fees for workers compensation matters on the other hand are usually around 20% (the exact calculation can be complex, and I can advise you how fees will be calculated for your case. Please also see the section below that discusses workers compensation fees). With an attorney on your side, you can be assured that nothing will be missed or overlooked, and you won’t have to do the work. You can – and should – be focused on your recovery, and not on learning workers compensation law. You also will be able to obtain the highest possible settlement if you have representation on your side. As a result, retaining an experienced lawyer to fully protect your rights makes good sense. Not having legal help on your side only serves to help the insurance company take advantage of you. Don’t let that happen! The last thing you want to do following a work injury is to make the situation worse by not having representation. This is one workers comp claim mistake that will really hinder your rights. The insurance adjuster is likely very nice to you and seems to really care about you. Nothing could be further from the truth. Before you know it you are signing documents and waiving rights you didn’t even know you had. All of a sudden, the already stressful situation you find yourself in is only getting worse. You find out your workers comp checks are suddenly being reduced, or even terminated. You may also discover that the insurance company refuses to pay for the medical procedure you dearly need to have. To us you are not just a file, but a person who deserves all the protections and benefits that workers compensation provides. If the insurance company does not pay you what you are owed, then we will file a claim for you in court. By hiring us as your worker compensation lawyers, you get experienced, qualified and personal representation from start to finish. We will always promptly return your phone calls. We will keep you updated on the status of your case, and will work tirelessly to maximize all the benefits you are entitled to. What Are My Rights Under Massachusetts Workers Compensation Law? Workers’ compensation in Massachusetts is a compromise between workers and employers. This legal framework is found at M.G.L c. 152. When workers in Massachusetts get hurt at work, they are entitled to have their medical bills paid. They are also entitled to be paid for their lost wages. Such compensation is paid even without a showing of fault on the part of the employer. In exchange, workers cannot sue their employers for negligence in court. Medical Bills. As long as the work-related medical treatment you receive is reasonable and necessary, then the workers compensation insurance company needs to pay for it. If they refuse to pay these bills, we can file a claim for you in court. There is one important caveat – insurance companies are only required to pay for treatment that is reasonable, related and neccessary. Many medical treatments are helpful (or necessary) to help relieve pain, but they may not in fact lead to an improvement in a worker’s ability to perform work (such as gaining strength or an increased range of motion). In such cases, insurance companies will seek to deny treatment. I oppose these efforts and fight for injured workers so that their medical bills are paid. Wages. If you are totally disabled from working, you have the right to temporary, total disability benefits. This weekly benefit wage rate is 60% of your gross weekly wages. If are able to work light duty, then you may collect 75% of your total disability rate of pay. It is important to have an attorney who will explain your rights and entitlements and who will work with your treating physician to understand the limitations that may apply so that you can get full benefits. Loss of Function. You may collect a one-time payment for any loss of function of a body part you sustain as a result of your work accident. This percentage is assigned by a doctor. Scarring. If your work accident resulted in scarring to your neck, face, or hand(s) then you may collect a one-time payment for the scarring. The amount you may collect for scarring is set by law. The maximum amount is currently $15,000. Yes. It is very important to have legal representation on your side if you were injured in a work accident. Plus, since we don’t get paid unless we win your case, there is no reason not to have an attorney. Can I Get Pain and Suffering Damages? No. Massachusetts workers compensation law does not allow you to collect pain and suffering compensation for a work injury. What If I Work Two Jobs? If you have concurrent employment and were injured at one of your jobs – preventing you from working your second job – you can collect workers comp benefits for all wages you lose from both jobs, as a result of your work injury. You may however sue a third-party if it had a role in causing your work injury. If you are out of work and receiving your workers compensation checks, the insurance company will likely have you attend an IME in order to reduce or terminate your benefits. You have to attend this exam. You may request the insurance company to provide you with transportation. An interpreter is also provided if needed. This happens quite a bit. Even if your employer does not carry workers comp coverage, you may still bring a claim for benefits. The Massachusetts Workers Compensation Trust Fund provides benefits in this situation. The employer can be subjected to severe penalties should it not carry workers compensation insurance. Hire us. We will come visit you at home, or wherever is convenient for you. We handle workers comp claims throughout Massachusetts. What Injuries Are Covered Under Workers Compensation Law? It covers injuries (including physical and mental) arising during the course and scope of employment. Can I Go To Any Doctor I Want For My Medical Treatment? Yes, but you may be required to see the insurance company’s doctor at some point for an Independent Medical Exam. Only employees. Independent contractors do not qualify for Massachusetts workers comp benefits. Depending on the case, it may make sense to lump sum settle your benefits. We can negotiate a favorable settlement for you. This would be a one-time payment that would close out your claim for your wages. Depending on the terms of the settlement, the insurer may have to pay for your future medical treatment as well. Can I Collect Benefits If I’m At Fault For The Accident? Yes. Workers comp benefits are no-fault benefits. As long as your injuries arose during the course and scope of your employment, you are eligible for workers compensation benefits. Four years from the date of injury. If a claim is filed in court (Department of Industrial Accidents), and you have an attorney, then you don’t have to go to the Conciliation. But, if the claim advances to Conference, you will need to go to that event with your workers comp lawyer. The same is true if the claim goes to a Hearing. Are workers comp checks and settlements taxable? No. Neither Massachusetts or federal law requires taxes to be paid on workers compensation checks and settlements. What If I Hire You and We Don’t Win? We do not collect a legal fee unless we win your case and get you the benefits you are entitled to. What Does A Boston Workers Compensation Lawyer Do For Me? Workers compensation lawyers represent people who have suffered personal injury at work. They fight insurance companies that seek to deny the benefits that injured workers are owed. Insurance companies have their own workman comp lawyers to represent their interests in court. The representation involves investigating all benefits the client is entitled to, negotiating with workers compensation adjusters and attorneys, going to the Department of Industrial Accidents, collecting and analyzing medical records, as well as other tasks. Many cases settle, and a workers comp attorney will work to achieve a fair and just settlement for your case with the insurance company. In addition, legal representation provides you with piece of mind so you don’t have to worry about the legal process while you heal from your injuries. 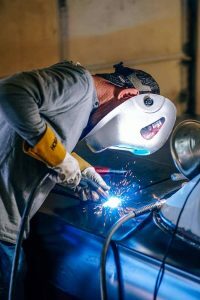 Insurance companies have their own workers compensation attorneys that are paid to represent their interests in court, which means limiting the rights of injured workers as much as possible. If you had a work injury in Massachusetts and miss 5 days from work, your employer must complete a Form 101. This form must be filed within 7 days of your 5th missed day from work. The form is then sent to your employer’s workers compensation insurance company. The insurance company has 14 days following its receipt of the Form 101 to start paying you, or to deny your claim. If the insurance company agrees to start paying you, they will file a Form 103. If they deny your case, they will file a Form 104. If the insurance company denies your case, then a claim for benefits needs to be filed. That is done with the filing of a Form 110. Our Boston workers compensation attorneys can prepare and file this important document for you. All Massachusetts workers compensation disputes are handled at the Department of Industrial Accidents. This court has branches in Boston, Lawrence, Fall River, Worcester, and Springfield. The Department of Industrial Accidents is an administrative law court with administrative law judges. It handles only workers compensation disputes. The first step is the Conciliation which is when you (if you do not have an attorney) or your attorney appears in front of a Conciliator. The attorney from the workers compensation insurance company will be present. The Conciliator decides if the matter is ready for judicial review. If the case does not settle at Conciliation then the matter will be sent forward for Conference. The Conference will be held before a judge between 2-4 after the Conciliation. A request for a speedy conference can be made if the employee is experiencing financial hardship and can’t wait 2-4 months to get in front of a judge. At the Conference you, your attorney, and the attorney from the insurance company will be present. The parties will submit evidence to the judge. The majority of evidence is typically medical records of the injured employee. The judge will hear from both sides and will issue an order. The order will issue a few days after the Conference. If either party wishes to, they may appeal the Conference order, but this must be done within 14 days of the date of the order. This deadline is firm but can be extended. When an appeal is filed for medical reasons, then an impartial medical exam is scheduled. The impartial doctor is from a panel of neutral judges the Department of Industrial Accidents uses for medical exams when a Conference order is appealed. The fee for this exam is $650 and is paid by the appealing party. Next is the Hearing which will be held several months after the Conference. This is similar to an actual trial. The report made by the impartial medical doctor will be the only medical record the judge will review, unless the judge agrees to consider additional medical evidence. Oral testimony may be given at the Hearing, and the judge will then make a decision and notify the parties. The final and highest stage of the workers comp dispute process is the Reviewing Board which will take many months after the Hearing. This appeal stage must be requested 30 days after the Hearing decision is issued. What Fees Do Workers Comp Lawyers Charge? There is no up-front money needed to hire us as your legal representatives. Massachusetts law sets forth how much workers comp attorneys may collect in fees for these cases. Essentially, if your attorney is successful in getting you on, or kept on, workers compensation benefits, he is paid a fee by the insurance company. In the event of a lump sum settlement, if the insurance company agrees to pay for your future work-related medical treatment, the attorney collects a fee of 20% of the total settlement. If the insurance company does not agree to pay for future medical treatment, the attorney then collects 15% of the total settlement as a fee. Massachusetts workers compensation law also allows the attorney to be reimbursed for any out-of-pocket expenses he advanced. Many times agreements are made to pay an employee for a closed period of benefits. That agreement would pay you benefits for the period of time you were out-of-work. We provide personal attention to each client we serve. We give relentless dedication to achieving the best possible result for your case. We provide consistent case updates and timely return calls (or emails). We are a team of professionals dedicated to getting for you the best outcome for your case. We have experience dealing with and effectively negotiating with insurance company adjusters and lawyers. We give you peace of mind. Let us handle your case so you don’t have to worry about it while you recover from your injuries. Sometimes injured workers have not only a workers compensation claim, but also a third-party liability claim for negligence as well. These claims arise from work accidents that were due to the fault of a person or company, that is not connected to your employer. These situations occur commonly with construction accidents, as well as car accidents. For example, if you are operating a vehicle for work (whether it be your personal vehicle or a company vehicle) and someone negligently hits you, then you have a workers compensation claim since you were hurt on the job. But you also have a third-party claim for negligence against the person who hit you. Or, if you slip and fall at work in the parking lot due to snow and ice there is both a workers comp claim, and a third-party claim, if a third-party such as a snow removal company negligently failed to clear the snow and ice in the parking lot. Obtain prompt medical attention. With a work injury, sometimes injuries that may seem small at first – such as a back sprain – may in fact be much worse. These cases largely turn on what your accident-related medical records say. It is important to thoroughly report to medical personnel that your injuries occurred at work. It is equally important to stay consistent with your medical treatment. Report the accident as soon as possible to your supervisor after first obtaining medical treatment. The may not be possible until the next day, depending upon severity of the injury. Never sign anything the workers compensation insurance company sends you. Promptly consult a Boston workers compensation law firm. Call to find out how we can help you. We are easy to talk to, and will give you a free case evaluation. We will let you know all rights and benefits you may be entitled to. If we accept your case, we only get paid if we win your case. Contact us for immediate answers to your workers compensation questions, even on nights and weekends, and read about who we are and what we do. Read what our past clients say about us, and see our Yelp reviews, and our Google reviews. We work hard to get our clients results. Our overwhelmingly positive reviews reflect how satisfied our clients have been with our representation. Boston workers compensation lawyer representing injured workers in Boston, MA and serves clients throughout Massachusetts including Cambridge, Somerville, Chelsea, Everett, Malden, Revere, Lynn, Lawrence, Andover, Newton, Quincy, Medford, Plymouth, Worcester, Fall River, Bellingham, Weymouth, Natick, Stoneham, Wakefield, Reading, Wilmington, Burlington, Lynnfield, Saugus, Peabody, Danvers, Middleton, North Andover, North Reading, Woburn, Canton, Stoughton, Randolph, Dedham, Norwood, Mansfield, Taunton, Brockton Suffolk County, Middlesex County, Essex County, Worcester County, Norfolk County, Plymouth County, Bristol County and Barnstable County.